Scott arrived in Europe Jan 13th. He’s spent the past six days training at Paganella, Italy, near Trento. Unfortunately he has limited (almost none) internet access, so don’t be looking for blogs at his site. Paganella is where the USST stays to train while in Europe. I don’t know all of the details, but they have a support relationship with the community and ski area which nets lodging and training at either no, or greatly reduced, cost. They have a dedicated ski trail for training, which by all reports is very steep. Scott’s schedule changed numerous times before flying over here, and when he arrived he discovered that he will only race three Giant Slalom races during these two weeks. Although disappointed, he’s focused upon capitalizing on the good training venue while trying to enjoy Europe. He’s working hard on his German as well. 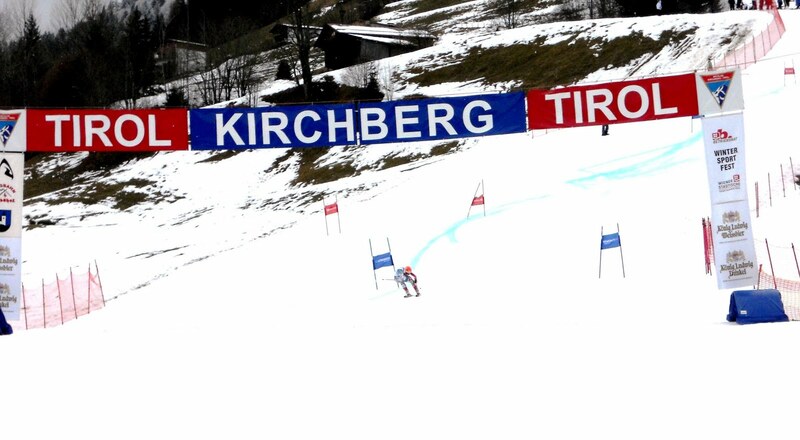 His first race of the trip was today at Kirchberg, Austria, which is in the Kitzbuehl valley. It was a Giant Slalom on a fairly steep pitch. It rained last night and intermittently today, with foggy patches coming and going during the race. Scott started 78th in a strong field. The course was pretty chopped by the time he ran, but he climbed to 51st after the first run and 38th overall after the second. He skied conservatively at times “to miss the biggest holes…”) but finished both runs without major incidents. Given how his tech races have gone thus far this year, he was most interested in having a solid finish. Scott ran into his two Austrian friends from the 2008 Trofeo Topolino today. He’s been staying in touch with Christian Juffinger and Christian Steiner via Facebook and they were the impetus for him studying German. I hope he got to regal them with his linguistics – forgot to ask. He returns to Paganella tonight and I’ll see him again the 24th and 25th for two more Giant Slaloms at Zell am See, Austria. 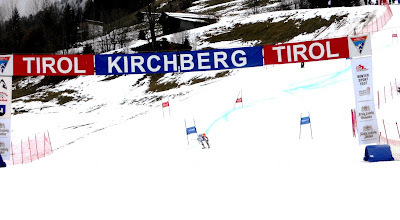 In the interim I’m going to do something I’ve always wanted; I’m going to Kitzbuehl during Downhill week. It should be an amazing experience. Instead of flying clear across the USA after the Quebec NORAMS, we headed South to Virginia for a week of rest, recovery and repacking. Half of the time was spent at Bryce Mountain, where Scott first learned to ski at age two. It’s a great hill with only about 600 feet of vertical, but a dedicated 63 member alpine racing team. We spent four days there with two devoted to training with the local team and spending lots of time with kids and parents. The head coach, Phil Perkins, is a long time friend of mine. He and his wife Karen head the staff and devote all of their time and energy to these kids. They had Scott and I work as guest coaches. The biggest challenge was ensuring Scott spent an equal amount of time with each group. The kids loved it and Scott got writer’s cramps signing autographs. 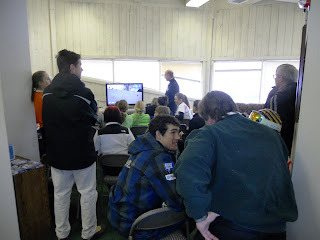 Saturday night Scott met with the parents and athletes for a brief talk and Q&A session which lasted about 45 minutes. There were lots of good questions about everything from diet to training and ski preparation. They take their racing seriously down here. Management also used Scott as the NASTAR pacesetter (like he did at Schweitzer in December), thus saving the mountain the expense of sending their pacesetter to trials at Round Top, Pennsylvania later this month. NASTAR at Bryce is a different bird. Instead of being open for a period of time with customers showing up whenever they wish, this mountain has always treated it like a race. An entire run is closed off, numbers are issued, lots of speed suits are worn… one guy even carried to the start line. Folks stop what they’re doing to watch the “race.” Good fun! We ended the visit Monday morning with a private slalom training session on a slope all to ourselves. After two days resting and reorganizing in DC at my best friend's house, Scott boarded the plane to Munich on Thursday. This is an interesting region. I’ve never been here and I find both the terrain and the people fascinating. The mountains are small, but often rugged, laced with bands of vertical granite. The area is a network of small villages, connected by valleys, each with their own small shops and restaurants. It reminds me of where I grew up in the Catskill Mountains of New York. The region has numerous small ski areas, many within 10 km of each other. Back in the 60’s the Northeast US also had bunches of small ski slopes, but they’ve since been run out of business by the conglomerates. This place is definitely a throw-back. The people here are very Euro. I didn’t realize how acutely English is a second language up here. Everything starts in French. Many of those who speak English have difficulty with it. This has been a great dress rehearsal for me before heading to Europe next week. But so much for the window dressing. The snow was great for competition this week. The cold temps persisted and the courses held up pretty well considering the level of competition. The slalom hill here has varying pitches and winds its way down the hill providing many interesting options to the course setters. By all reports, the slalom sets were challenging yet fair. Scott suffered another two frustrating days of competition. He’s skiing really fast 95 percent of the time. It’s those times he either stops completely or has to hike uphill that are killing him. He’s in that spot where there’s really not much he can do but keep plugging. Unfortunately, after several frustrating weeks, it’s hard to stay upbeat and believe in oneself. Yesterday did end on a high note. Scott had a great first run going when he straddled a gate. By the time it registered and he stopped, he was left with about 30 meters to climb uphill. He finished 8 seconds behind the leaders, which may give a clue how well he’s skiing when pointed downhill. He was the last to start the second run, on a chewed course, and really threw it down the hill. He finished the second run 1.3 seconds slower than the winner, which is doubly impressive when considering their relative start orders. Scott was elated and it was the best smile I’ve seen from him in weeks. It’s not a win or a score, but it was a much needed boost for the boy. It’s hard to keep plugging when you lose faith. Yesterday restored his faith. I had a slow day with nothing to do but read and hang out. I drove to both mountains to look at the tracks, got some food, unpacked skis, etc. The temperatures dropped today and are supposed to be in the high teens tonight, so there should be a good race surface this week. Travelling across the northern plains is an interesting experience, no matter what the weather. The people are amongst the friendliest I’ve met. Once I left North Dakota, I was off interstates and on secondary roads, so got to see lots of small towns and enjoy home cooking at a few “Mom and Pop’s.” All good. I’ve never driven across Wisconsin and Michigan in the dead of winter. The country’s pretty flat, but the lack of major ski hills doesn’t relegate the folks to the indoors. Snowmobiles are everywhere. People drive them to town, fuel them at the truck stops, park them outside diners. The road shoulders and ditches are so tracked they look as though a groomer came through. And in Michigan they run plastic strips across the roads where most snowmobilers cross, presumably to protect from wear on the skis. Different. Scott arrived in Burlington at 11 last night, and the team got here around 1:30PM this afternoon. He skied a little this afternoon, which is a good thing. 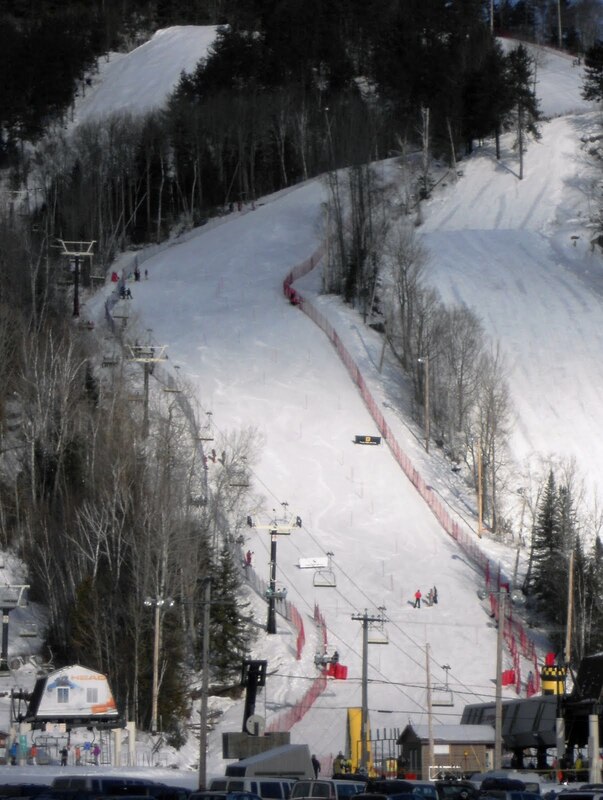 Tomorrow will be slalom on what looks like a good hill. I love to drive. I just plug in a good book (four this trip), turn on the cruise control, and veg. I really enjoy seeing our country, close up, and meeting new folks wherever we go. This is my second trip across the US for ski racing and lots of folks look at me like I’m weird. Of course, I got the same looks when I drove to Alaska for US Alpine Championships two years ago… until Mount Redoubt erupted then stayed active and I had the only reliable way home. In addition to being fun, driving saves us money and simplifies things from my perspective. For instance, this trip would have involved another plane ticket, lots of excess baggage fees, rental cars, etc. And then there’s the pleasure of dealing with the airlines and TSA. I’ll stick to driving whenever possible. Scott flew across country, which allowed him to spend more time at home. His trip to Vermont (where he linked-up with the Team) took all day and involved three flights. Fortunately he only had carry-on bags to worry about. As you might have guessed by the title of this blog, the drive wasn’t as relaxing as I’d hoped. Watching the weather closely, I left home the afternoon before I’d planned in an attempt to beat a vicious cold front. I never quite got away from it and sort of “surfed” the leading edge. As a result I was in high winds with very limited visibility the first three days, averaging only 50 MPH. Fortunately I broke out in Michigan, then spent two days in driving rain and thick fog with temperatures in the 40’s. Anyway, I arrived in Quebec one day ahead of Scott. From a race perspective this rain is a good thing. It appears these folks got a lot of new snow recently. With all this rain it’s settled and smooth. If it freezes we’ll have a great ice layer. If it doesn’t the snow is now ready for salt to harden it. Either way the athletes will have a good race surface. With nothing else to do tomorrow, I’ll continue this travelogue.